tube outside diameter (TOD) — Usually specified in inches or millimeters. Note that certain nominal “pipe” diameters vary considerably from their true diameters, therefore, the pipe system (e.g., IPS, EMT, K-type) must also be specified. wall thickness (WT) — Specified in inches, millimeters, or wire gauge unless the material belongs in one of the pipe systems. In that case, the schedule number or other wall thickness designator of the system should be specified. If the wall thickness varies by 5% or more, it is advisable to specify the thickest wall dimension. 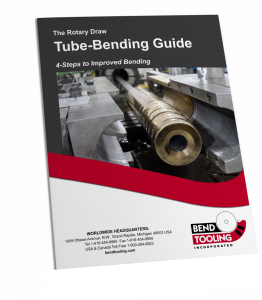 centerline radius (CLR) — Specified in inches, millimeters, or “D” of bend. “D” is the ratio of the centerline radius to the nominal, not the true, outside diameter of the material: “D” = CLR / nominal TOD. See “D” for details. depth of bend (DOB) — Specified in degrees. material (MATL) — Tubing material. machine (MACH) — Make and model of machine.